Limber Up Your Mind at the Library! A few months back while I was searching for some books to interest my special niece; I came across an interesting young adult series written by a woman named Amanda Hocking. After reading an excerpt from it I decided that it was something also worth exploring for myself. The author began her writing career without a major publisher; instead publishing her books herself electronically and after 2 million dollars in sales (which is completely unheard of for those following this path) she did finally land a publishing deal with St. Martin’s. The author has currently written over a dozen titles and many of which may well be of interest to some young (or young at heart) readers in your life. The title that I have just finished was called: Switched. It starts with the main character, a 17 year old Wendy Everly, recounting her particularly unpleasant and life-changing 6th birthday party. As the novel unfolds you begin to understand more about this particular event and the motivating forces behind it. You will get sucked into a world of mythical creatures and hidden cities; forbidden love and prophecy. The story is well-crafted and filled with unexpected situations and twists. It is the first in a Troll-ogy (trilogy about trolls) and I would highly recommend it to anyone looking for something that will definitely entertain. Books are always a great Christmas gift…but if you want to try-before-you-buy; don’t forget to borrow a copy from the local library! Halloween Scary Story Competition Winners! Thanks to everyone who submitted scary stories to the Kelowna Branch Scary Story Competition! PS - they are pretty scary, so please read them first before showing younger children! Blood is everywhere, there is no escape. Blood is dripping from the walls and trickling through the air vents. It’s flowing in from under the doors. The doors locked from the outside. No escape. The blood is up to my shoulders now. I close my eyes and sink under to drown myself. I wake up in cold sweat. Where am I? I look around for clues. Blood is on the walls, on the floor and on me. I find a sharp, bloodied knife lying beside me. I look around more and find a mutilated body on the ground. I examine it further and it slowly realise that it’s the body of my son. What happened? I follow the trail of blood to my bedroom, odd. I find my soon-to-be husband isn’t there and the blood trails to the closet. I slowly open the closet and I find a small handheld mirror. I look at the reflection and I see a monster with eyes oozing a black goop out of its eyes and covered in fresh blood. This has to be a bad dream. I try to wake myself up but when I open my eyes I’m still there. I glance back into the mirror to look behind me and the monster is gone. I shake my head; it must have been a hallucination. I am a little dehydrated and who knows how long I was on the floor. I turn around to continue searching but then I see him across the hall “Jake!” I yelled to him “I’m so happy to see you! I was afraid something bad happened to you!” I run up to him but he screams and runs as fast as he could away “Jake?” I felt tears sting my eyes. Why was he afraid of me? I look back into the mirror to try to see if I looked different. I shriek and throw the mirror down. In the mirror I saw why he was so afraid of me; I was the monster. I try desperately to remember what happened last night but the only thing I remember was the nightmare. Kill. Kill. Blood shall flow. The voices had repeated that over and over as the room filled up. The voices had started up again and whispered in my ears. Wouldn’t it be nice to just give in? Just kill him so he can never run away from you no matter what! Just think about the warm blood, so comforting, so soothing. They got more and more convincing until I just gave in. I ran down the stairs, no longer in control of myself, and I sunk my nails into him. I hit, scratched and stabbed him until he was completely limp. I was afraid of how much I enjoyed it but now I am not. No one can stop me. I had always loved to travel. Who knows? I could be watching you from nearby. You look awfully lonely, mind if I join you? The Provider is here. I think it’s around food time. I hope The Provider has meat for me, meat is always warm. The Boy in the Corner reminds me that not all meat is warm, sometimes it’s cold. The provider is here, he has food. I know that the provider is a he because he has short hair, just like The Boy in the Corner. I have long hair, like Rapunzel, so I’m a she. The food that The Provider has is not meat. That’s too bad, but it’s still food. He is a good provider. The Provider is not here today. I hear lots of sounds coming from the up-the-stairs. Sometimes this happens. The Provider says when other hes and shes come to his living space he has to pay attention to them. The Boy in the Corner asked me to read to him, he picked The Snow Queen. He sits with me on my mattress. The Provider gave me it last week as a gift. It’s a lot more comfy than the ground. I hear banging and a scream. I hope that I get meat tomorrow. The Provider has meat for me today! It’s always the best when it’s red and drippy. After food he plays a game with me. He hides the bones from the meat and I try to find them. If I can’t he wins. He always wins. The Provider also braided my hair. The Boy in the Corner was making faces and made me giggle. The Provider asked what was funny. I stopped giggling. He gets angry whenever I talk about The Boy in the Corner. He says he doesn’t exist. The Provider didn’t come today. But I don’t hear any sounds. I’m sure The Provider is ok. The Provider is always ok. The Boy in the Corner is saying rude things about The Provider. I curl up on the mattress and pretend that I don’t hear him. The Provider would never forget about me. The door opens but The Provider doesn’t step through. Only a bag full of leftovers gets through before the door to the up-the-stairs shuts. The Provider hasn’t come down in a while. I’m very hungry. The Boy in the Corner says that I’ll be like him soon if The Provider doesn’t come down. I’m scared. The Boy in the Corner says not to be, that it’ll be ok in the end. I’ve been reading to him lots. I wish he could read to me. Or braid my hair like The Provider used to. I miss The Provider, I hope he’s ok. There are lots of sounds coming from the up-the-stairs today. The Boy in the corner looks scared, he’s never scared. The door opens and The Provider comes down very fast. Then the door shuts. I move over to The Provider but he doesn’t react. The Boy in the Corner says it is food time. That this is the only way The Provider could provide for me. My stomach rumbles and I take the first bite. He is a good provider. This month I have something a bit different to recommend; a Young Adult novel written by James Patterson and Emily Raymond: First Love. This title was published earlier this year and tells the story of two teenagers who embark on an amazing journey of discovery. Axi is a sixteen year old girl who has suffered much through her life: a younger sister who died of a cancer that she herself is battling, a mother who chose to leave her family after the sister’s death and Axi’s diagnosis, and a father who is slowly drinking away his sorrows. Axi was always the good-girl; predictable, responsible, and eager to please others…until one day she decides it is time to break free of her good-girl ways and drag her best friend Robinson off on an adventure across the United States. Robinson’s good humour, bad-boy ways, and incredible magnetism helps Axi break free from her fears and find the courage to ask for what she wants most in the world. I would recommend this title to teens (or adults) who have enjoyed stories written by author Lurlene McDaniel, Jodi Picoult, or even Nicholas Sparks. The storyline is perhaps a bit predictable, but it cleverly mirrors the main theme of the book: It really is about the journey- not the destination! So grab some ice cream or chocolate (or whatever your go-to comfort food of choice may be,) and sit down for a few minutes with this title. I don’t think you will be able to put it down for very long! The library has many copies of this book available and it is also available as an eBook. I am happy to report that I have just finished reading Diana Gabaldon’s eighth title in the Outlander Series: “ Written in my own Heart’s Blood.” This title takes place directly after book seven and features more of the characters, adventures, joys, and sorrows dedicated readers of this series love. But for those who aren’t interested in this series, or haven’t yet caught the reading bug for these stories; I would like to introduce you to something a little bit different. “Miss Peregrine’s Home for Peculiar Children” (also available as an ebook) was published back in 2011 by Ransom Riggs (this being his first novel) and is considered to be a children’s chapter book. I read this title last year and was thoroughly impressed with the storyline, themes, and characters. I see that Tim Burton is working on a movie version of this story set to be released sometime next year…and that a sequel to this story was published this past January. If you like adventure stories with a bit of “spooky” this would be a great choice. I would recommend this title to adults, young adults, and kids alike (though some younger kids might find the book a bit disturbing…but with some parental discussion they should manage just fine!) If you want to beat the rush that will likely happen when trailers for the movie start coming out; pick up a copy today! The library or a good bookstore should be able to provide you with a copy of this amazing story. forgotten hero who inspired such classics as The Count of Monte Cristo and The Three Musketeers. The man is virtually unknown today but his story still resonates because his son Alexandre Dumas used it to create some of the best-loved heroes of literature. The story of his father, of mixed racial and cultural heritage born in Saint-Domingue (now Haiti) to a slave mother and a French nobleman father, is almost completely lost to history solely due to his race. But Reiss brings this remarkable man to life in The Black Count. The book is brilliantly researched and the author draws on the material Alexandre Dumas incorporated into his own novels and memoir. The work explores the life of his from the time he arrived in France, through his schooling as a sword-fighting member of the French aristocracy and his subsequent rise from a lowly private in the dragoons to a respected general who marched into Egypt at Napoleon’s side. Dumas came of age at a unique time in history during the French Revolution, a brief period of equality in the French empire. During this period numerous opportunities arose for the son of a slave that would not have emerged 20 years before or even 20 years later. Dumas, a dynamic individual of tremendous courage and physical gifts, took full advantage of the opportunities and ended up commanding armies at the height of the Revolution in campaigns across Europe and the Middle East, only to one day face an implacable enemy he could not defeat. A great American author once wrote that truth is stranger than fiction. In fact, truth is sometimes far stranger than any fiction ever created. If you dare, read The 900 Days: The Siege of Leningrad, is a riveting narrative nonfiction epic by Harrison E. Salisbury about one of the harrowing and heroic chapters in the annals of history. In nine hundred days, beginning in 1941 when a German army blockaded the city, as many people died in Leningrad as the entire war losses suffered by the United States in the whole of its history – nearly a million and a half men, women and children. They died fighting in citizen militias on the front line, fell to the incessant German shelling that pounded the streets and avenues of city, starved in their unheated apartments and hospitals and froze to death in the frigid cold and deep snow of the brutal Russian winter. It is also believed that some even died to feed a thriving market in human flesh that sprang up in The Haymarket, a great peasant market before the war but now operated by fat, oily, steel-eyed men and women, the most terrible people of their day. There is no question people practiced cannibalism on a large scale during the darkest and most desperate months of the siege: the evidence clearly shows that people butchered corpses on a widespread basis. More people died in the Leningrad blockade than ever died in a modern city – anywhere and anytime. But 600,000 people remained when the Russians finally broke the siege and Salisbury weaves the stories of these survivors, and those who died in this city of ice and death, through the fabric of this searing narrative. Storytimes resume in September, so this seems like a good time to talk about the importance of early literacy. Early literacy is defined as the pre-reading skills children acquire from ages 0-5, which help them prepare for and succeed in school. Children are born with 100 billion brain cells, the same number as adults, and 85% of those cells are developed before kindergarten. Brain researchers liken brain development to building a house, and the first three years are vital to building a strong foundation and framework. The bonds a child forms in his early years are crucial to future learning and success. Parents are children’s first teachers, so at the Library we work to educate parents on the importance of shared reading and learning experiences. The Library’s programs and collections emphasize the five early literacy practices, as outlined in the American Library Association’s “Every Child Ready to Read” program: Sing, Talk, Read, Write and Play. Singing (which includes nursery rhymes) increases children’s awareness of and sensitivity to the sounds of words. It doesn’t matter if you are a “good singer” – children will respond to your voice before all others. Have fun with silly songs and bounces, or soothe children with lullabies and gentle swings. The Library has a great collection of children’s music CDs and nursery rhyme books. Talking with children helps them build their vocabulary and learn oral language. Self-expression and narrative skills are crucial to communication and developing interpersonal relationships. Talk to your child about your day together, ask them questions, and narrate your activities (e.g. : “Now we are putting on our shoes, so we can go and play at the park”). The Library is a great place for your child to interact with others his or her own age! Reading together, or shared reading, remains the single most effective way to help children become proficient readers. Expose children to a variety of books and authors – your library card allows you to borrow up to 100 items for 3 weeks at a time, so borrow away! Our board book collection is intended for our youngest readers – the thick cardboard, laminated pages stand up to exploring hands (and teeth!). 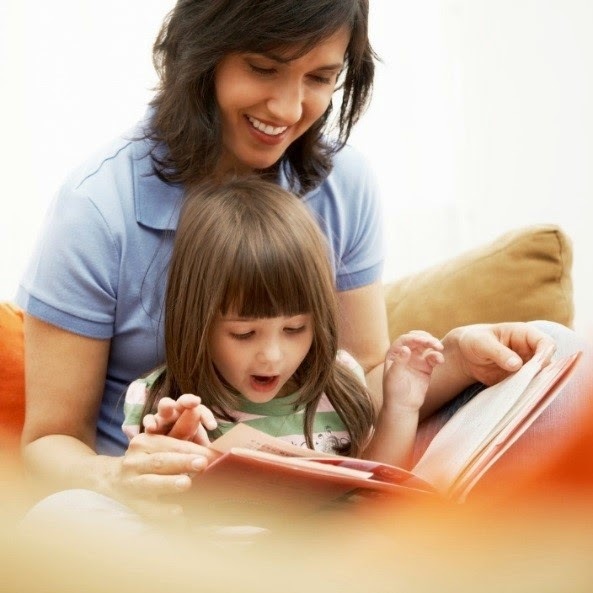 Let your child practice turning the pages, point out pictures together…let your child have fun with books. It’s also great to be a reader role model – if your child sees you enjoying books and newspapers, they will learn that reading is an enjoyable pastime. Writing, scribbling and colouring all help children learn fine motor skills and learn that written words stand for spoken language. Pick up your weekly colouring sheet at the Library and help your child practice writing his or her name. Point to words when you read together. Use alphabet magnets to put together sounds and words on the fridge. Playing helps children put thoughts into words and think symbolically, so they understand that spoken and written words represent real objects and experiences. Play develops their imagination, creativity and social skills. Children will often mimic real life situations (grocery store shopping or “playing library”), helping them make sense of their world. Storytimes for babies through to preschoolers are held at branches across the region! Details about these programs, and others, can be found on our website: http://www.orl.bc.ca. Have fun visiting the Library and exploring these early literacy practices with your child. Go Buggy for Books at the Okanagan Regional Library! Wintery Books for Inside and Out!